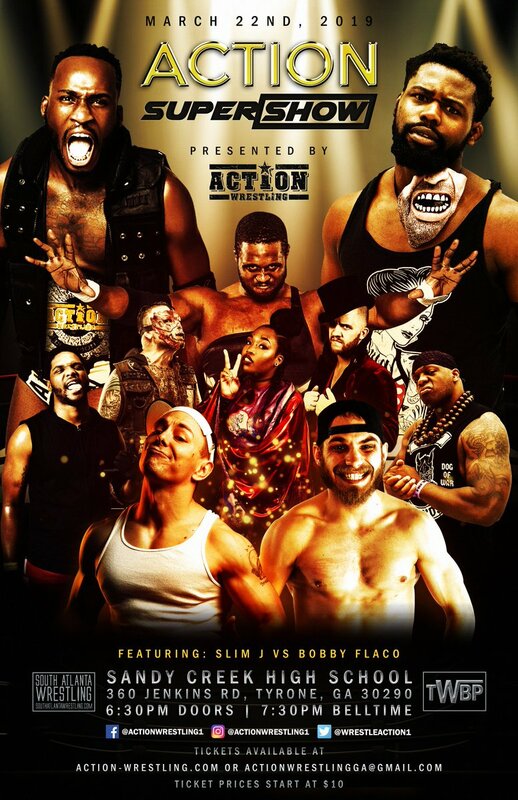 ACTION Wrestling 7 SuperShow at Sandy Creek HS is in the books. Even though the Watts Rules were banned, Michael Marshall pulled off the victory over crowd favorite "The Rock N Roll Model" Matt Sells. The upstart tag team of Cain Justice/Jaden Newman defeated The Carnies (Nick Iggy/Kerry Awful) through what I viewed as dubious means. Kerry had Cain in a Figure 4 when Jaden hit a big splash off the top rope and covered Kerry. It looked to me that Cain (still locked in the Figure 4) helped Jaden pin Kerry. Slim J was able to put away a game Bobby Flaco with Anger Management. The crowd was really into both guys. James Bandy survived the assault from O'Shay Edwards, and managed to pull of the victory. The crowd was WAY into the man I call "ACTION's Hometown Hero" James Bandy. Team TAG rushed out and jumped Matt Griffin from behind, and left him laying in the middle of the ring. It was a brutal beatdown although as most know The CEO is a retired professional wrestler. 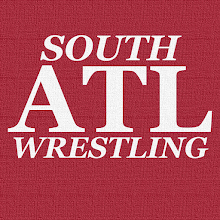 As a matter of fact Matt will be teaming with Cabana Man Dan, and "Superstar" Bill Dundee at the Scenic City Showdown in Chattanooga, TN. The main event was WILD, and saw Fred Yehi take out Arik Royal with the help of some pliers. Check it out on IWTV when it drops, you'll see what I mean. More to come on this show later this week, but I wanted to get the results out there ASAP. 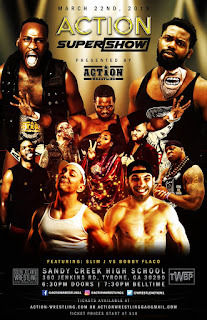 We won't be hitting it hot and heavy just yet, but we'll start looking at ACTION Wrestling 8 at East Coweta HS (F, April 26, 2019) soon as well.